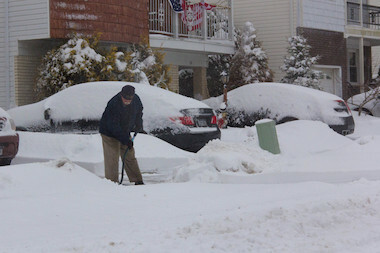 Residents were digging out their sidewalks and cars in Staten Island after the latest winter storm. Schools aren't the only things closed for the blizzard Tuesday — as New York City agencies, museums and libraries are also getting a snow day. With ice, snow and wind hitting the city during Tuesday's storm, the Sanitation Department focused on snow removal. That means alternate side parking has been suspended Tuesday and Wednesday due to snow removal operations. Meters will remain in effect. The city's Parks Department is advising New Yorkers to stay out of parks due to "high winds and low visibility."